Could you find the courage to do what's right in a world on fire? Pulitzer-winning journalist and bestselling novelist (Freeman) Leonard Pitts, Jr.'s new historical page-turner is a great American tale of race and war, following three characters from the Jim Crow South as they face the enormous changes World War II triggers in the United States. An affluent white marine survives Pearl Harbor at the cost of a black messman's life only to be sent, wracked with guilt, to the Pacific and taken prisoner by the Japanese . . . a young black woman, widowed by the same events at Pearl, finds unexpected opportunity and a dangerous friendship in a segregated Alabama shipyard feeding the war . . . a black man, who as a child saw his parents brutally lynched, is conscripted to fight Nazis for a country he despises and discovers a new kind of patriotism in the all-black 761st Tank Battalion. 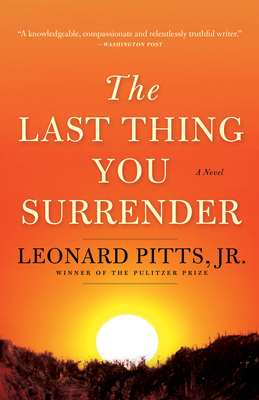 Set against a backdrop of violent racial conflict on both the front lines and the home front, The Last Thing You Surrender explores the powerful moral struggles of individuals from a divided nation. What does it take to change someone's mind about race? What does it take for a country and a people to move forward, transformed? Leonard Pitts, Jr., is the author of the novels Grant Park, Freeman, and Before I Forget, as well as two works of nonfiction. He is a nationally syndicated columnist for the Miami Herald and winner of the 2004 Pulitzer Prize for commentary, in addition to many other awards. Born and raised in Southern California, Pitts lives in Maryland outside Washington, DC.